Mark Knockemus has been an instructor at NETC since1999. He never tires of meeting the new crop of students each semester because they help him develop new methods of instruction. He is quick to smile and give his students encouragement, as well as challenge them to be critical thinkers, readers and writers. Besides tending to his students, he also gardens, raises backyard chickens, plays banjo and spends time with his wonderful family. 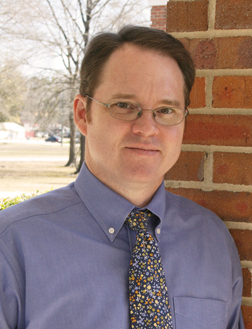 Mr. Knockemus graduated with a Bachelor of Arts in English from Huntingdon College, Montgomery, Ala. He earned a Master of Arts in English with a concentration in creative writing and 19th Century British literature from the University of South Alabama, Mobile, Ala. He is completing his graduate studies in theology from St. John’s University, Collegeville, Minn. He served as an adjunct instructor at Aiken Technical College before taking the faculty position with NETC. Mr. Knockemus prepares his students for intellectual growth. In his class, students learn how to write clearly and concisely, read critically and view literature as a reflection of its time and society.